It's been an interesting ride for the long-rumored Warhammer 40k MMO. In the works for many years, it eventually perished due to lack of funding. For a while, it looked like it would return in the form of a single-player RPG, but hopes for that also died, along with its publisher, THQ. Now that its cousin game, Warhammer: Age of Reckoning, shut down last year, conditions couldn't be bleaker. But like a dreadnought dropping out of warp space, Behaviour Interactive has arrived with Warhammer 40K: Eternal Crusade. Dubbed a Massive Combat RPG, Eternal Crusade is more Planetside 2 than World of Warcraft. Recently, I got to talk with Miguel Caron, Behaviour's Head of Studio, about Eternal Crusade, and how its recently-launched Founders Pack program works. 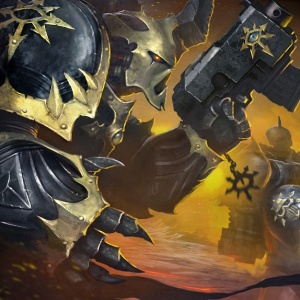 Behaviour's primary goal behind Eternal Crusade is to make the player feel like "an elite warrior in the 41st millennium," according to Caron. As we all know, in the grim, dark future of the 41st millennium, there is only war. Massive, thousand player war. Eternal Crusade will have a huge number of players from four different factions fighting over the pivotal world Arkhona. No hotbars, no cooldowns, just lots of twitch action with RPG progression across a single, persistent server. As Caron puts it, "it's Space Marine meets Planetside 2 meets Gears of War, in a sandbox setting". In fact, the dev team is currently spending a lot of time playing Planetside 2, studying it. Miguel said that SOE's high-pop shooter gets a lot right, but the glue isn't there. "[The] time to kill is too aggressive," he said, referring to the quick way many Planetside player's lives are ended, "it alienates new players." That's something that Eternal Crusade aims to correct. One way to do that is by making melee and ranged combat both equally important. While a long-ranged shot might down an enemy, someone will have to go up and execute them before a teammate gets them back up again. Eternal Crusade will primarily be a player-run game. Caron described a situation where a new player lands on Arkhona, fresh off the dropship, and right away a commander issues him an order to grab a freshly-requisitioned tank and take out a nearby Eldar Fire Prism, allowing two nearby friendly squads to advance on an enemy outpost. Each player is dropped into a squad. Ten squads make a strike force, which are in turn controlled by the five players on the war council. Repeat this four times for each faction. Each level of this hierarchy is completely player controlled, similar to Eve Online. Unlike Eve, Eternal Crusade is all about the WAAAAGGH. As Caron joked, "no one wants to be an elite merchant in the 41st millennium." To get all this running, Behaviour is harnessing some new tech. To get all the players in a single game world, it's using Pikko server tech, which was used to break the world record for simultaneous players back in 2012. It allows the devs to use many smaller servers to dynamically power a larger one, so everything can rebalance itself behind the scenes to power the massive battles you'd expect from 40k. Additionally, it will feature extensive voice chat from Razer, which will also have the ability to modulate voices so they sound appropriate for their respective races.